Please find attached an invitation to our Drug Awareness drive that we are holding this Saturday in Sector 4, specifically Orange Grove. 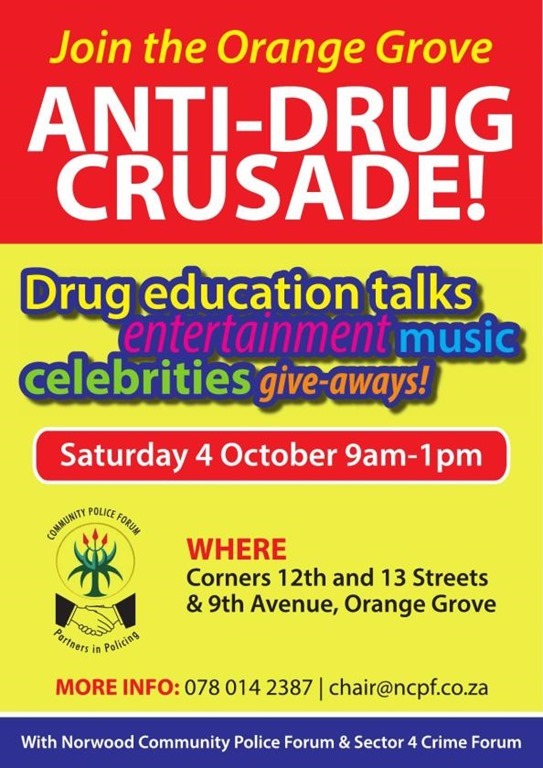 Focussed talks by all stakeholders will focus on drug awareness, abuse and what our community can do to report drug abuse and dealing. There will also be entertainment, refreshments and celebrities to keep our community engaged. Local celebrity and convicted drug mule, Shani Krebs, will be one of the celebrities talking about his experiences as a dealer and convicted drug mule. Please spread the word, if we can convince our youth that Drugs are not something that they should engage with then we can make a difference. We can also equip our community with the tools that they can use to report and get drugs off our streets. I would like to thank our Sector 4 Crime Forum for all their hard work in getting this event together. As well as my committee for all their effort and time!